A cluster of showers and thunderstorms in the western Caribbean has the potential to become the next named tropical system of the 2016 Atlantic hurricane season. The showers and thunderstorms in the area may begin to spin slowly later this week. Once this spin becomes fully circular, a tropical depression will be born. Once sustained winds reach 39 mph, the threshold for a tropical storm will be reached and the system would be named. The next name on the list of tropical storms and hurricane is Otto. The Caribbean is likely the most favorable area over the Atlantic basin for development over the next seven to 10 days. 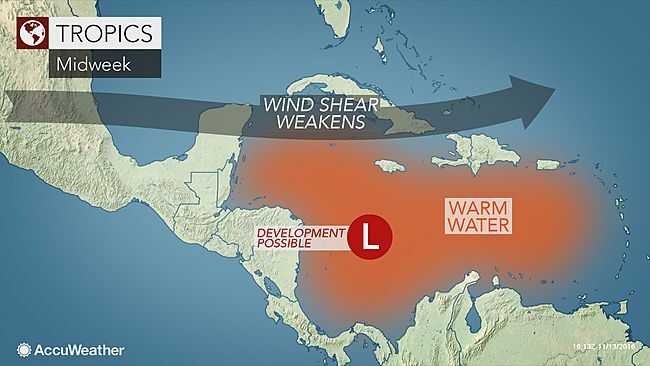 "Strong wind shear that has been present over the Caribbean in recent weeks is diminishing and waters are sufficiently warm to sustain a tropical system," according to AccuWeather Hurricane Expert Dan Kottlowski. Wind shear is the change in the movement of air at different levels of the atmosphere. Strong wind shear can prevent a tropical system from developing or cause an established tropical system to weaken. Warm water is needed to allow showers and thunderstorms to blossom. "Steering winds will likely cause the system to drift northeastward for a time during this weekend into early next week," Kottlowski said. Interests in the western and central Caribbean from Jamaica to eastern Cuba, Haiti, the Dominican Republic and Puerto Rico may want to monitor the development of the system. The odds are against the system to become as strong as Hurricane Matthew was. However, conditions could allow the system to become a strong tropical storm or hurricane. The greatest threats from such a system would be from flash flooding, mudslides and rough seas. Recovery from Matthew has been slow in Haiti, where it was the strongest hurricane to hit in more than 50 years. Matthew struck southwestern Haiti as a Category 4 hurricane on Oct. 4, prior to peaking as a Category 5. The hurricane killed hundreds of people in Haiti. 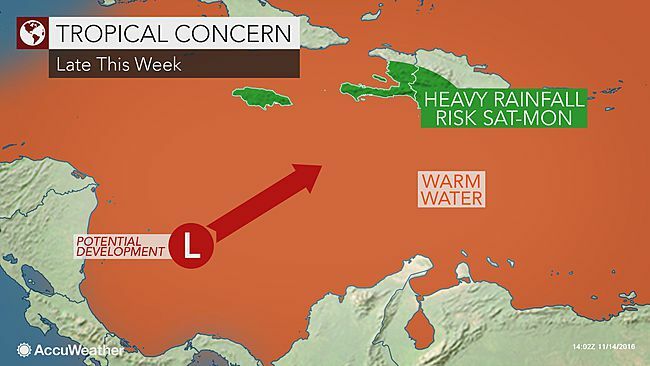 Haiti is especially vulnerable to heavy rainfall. Much of the nation has been deforested. Even less of protective canopy of trees remains in the wake of Matthew. Forests tend to reduce the speed of runoff during heavy rain events. "Beyond early next week, the tropical system may be forced southward later in the month," Kottlowski said. If that occurs, then the system will not be a threat to the United States or Bermuda but may remain a problem for land areas surrounding the Caribbean.